The nCLOSE for Apple iPad enclosure and nCLOSE custom mount combo is the ultimate combination to accept credit cards with the Authorize.Net Payment Gateway key-injected 3.5mm mobile credit card reader (Shuttle / UniMag II). Let nCLOSE protect your Apple iPad and mobile credit card reader in a soft-coated, durable, hard protective enclosure. 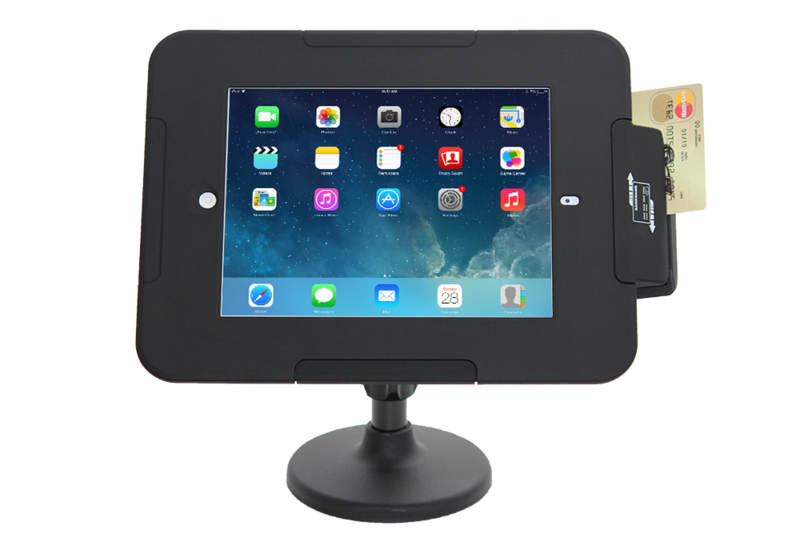 Adding the nCLOSE custom mount transforms your fixed Point-of-Sale (POS) into a mobile nCLOSE Point-Of-Sale (POS) tablet enclosure with the press of a button; or have your customer sign over the counter by simply lifting the Apple iPad. With your nCLOSE enclosure for Apple iPad have the ability to capture more data than a traditional Point-of-Sale (POS) with customer email, cell phone numbers and more. The nCLOSE custom mount can be mounted to most surfaces easily facilitating custom interaction unlike ever before.